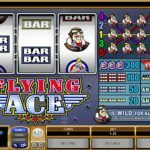 Flying Ace is an aviation themed video slot game from Microgaming. This is a perfect slot not only for aspiring pilots but for everyone else. With 5 pay lines there are plenty of opportunities to land a winning combination. This is the perfect slot for adrenaline junkies that like the risk of spinning the reels, what can bring more fun than that? Visually speaking, this is a very simple slot with 2 dimensional cartoon characters. There is nothing much on the plate when it comes to special animations either, but still it is a slot that can bring real thrill in front of you. Flying Ace is powered with only one special symbol, the wild. The wild has the function to substitute for all the other symbols on the reels and help in creating a winning combination. The game itself is the best part of this slot. This is where you can put to test your limits, and remember only risk takers can be winners in life. In terms of this game, if you are brave enough to place 25 credits per spin you might end up with life changing sums on your balance. If you play with all 5 pay lines you can win a potential x 6000 multiplier every time you land 3 matching pilots. 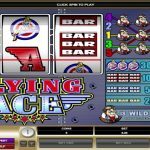 Microgaming is the proud creator of many classic retro style video slot games and Flying Ace is yet another addition to their impressive collection. This game really stands out of the crowd and it is worth playing. 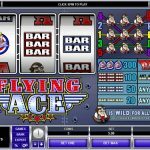 We know that it does not offer some complex features but it has all the essentials of a good, classic and timeless video slot game. Wan’t to play another great classic slot? Then you should consider playing Double Wammy a 3 reel slot by MicroGaming.